Korean International Cooperation Agency (KOICA) and United Nations Children’s Fund (UNICEF) in partnership with the Department of Health and National Nutrition Council, Thursday, January 24, 2019 at the Marco Polo Hotel, Ortigas. 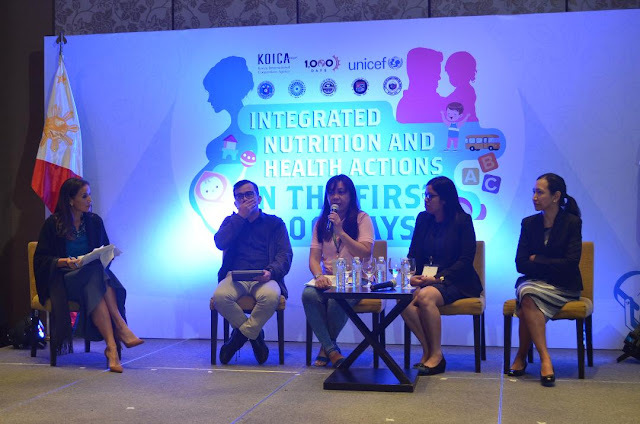 An initiative to combat malnutrition especially in vulnerable communities was launched by the Korean International Cooperation Agency (KOICA) and United Nations Children’s Fund (UNICEF) in partnership with the Department of Health and National Nutrition Council, Thursday, January 24, 2019 at the Marco Polo Hotel, Ortigas. The integrated nutrition and health programs target the first 1000 days of life of resistless children and mothers by providing them access to vital health and various nutrition services. The project is said to benefit 40,000 children below 5 years old and 57,000 pregnant/lactating women in the provinces of Samar, Northern Samar and Zamboanga Del Norte. The First 1000 Days initiative aims to establish more responsive and enabling policy milieu at the national and local level that supports the comprehensive approach to maternal, infant and child nutrition and health in the critical first 1000 days window. As studies by UNICEF Philippines and National Nutrition Council shows that under-nutrition continue to pose risks to children under 5 and their families which leads to irreversible ravages to health, physical growth and brain development. “The Korean government fully supports the Philippine government in its goal of addressing malnutrition and achieving universal healthcare so let us continue to walk closely to reach our common goal”, said by His Excellency HAN, Dong-Man, Ambassador of Republic of Korea to the Philippines. Messages of commitment coming from the Department of Health, National Nutrition Council, Provincial Government of Samar, Northern Samar and Zamboanga Del Norte overflowed as they showed support in the delivery of quality and comprehensive nutrition and health services for the First 1000 Days of Life. Meanwhile, the Provincial Government of Quezon being the first province to champion the First 1000 Days initiative through their Quezon’s First 1000 Days of Life (Q1K) deeply showed their support by sharing their best practices and innovations as discussed by Dr. Grace V. Santiago, Q1K Program Management Officer and Provincial Officer II. Q1K Program was launched in the year 2015 in twelve pilot municipalities of Quezon that aims to optimize the implementation of the National and Provincial programs on maternal and child care that encompasses three major components namely; Health and Sanitation, Food and Nutrition and Social Care. The success of the said program paved the way for its province-wide implementation covering 2 cities and 39 municipalities.